If you are lucky (or unlucky) enough to have an entire room set aside specifically for crafting this can be a good or a bad thing. I find that most crafters are like me. 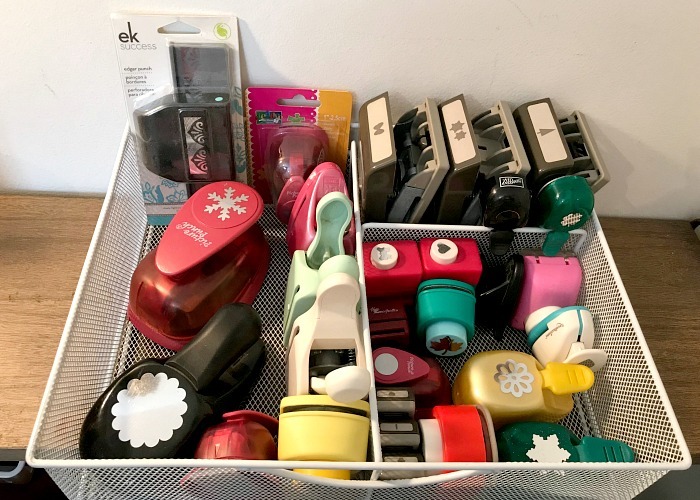 They (well, we) believe you can never have too many craft supplies and purging rarely happens because well you just never know when you might need that random purple button shaped like a unicorn. Just sayin’. Rather than purge how about we find a way to organize and sort what we have. And how about we do it spending next to nothing. No, it may not be pretty…but pretty just isn’t how I roll. Simple and effective is my thing and if that is your thing too then stick around for a while. We are going to be great friends. I am a card maker so brads are a must. Of course, you can never have just one color, you need many MANY assorted colors and sizes of brads. 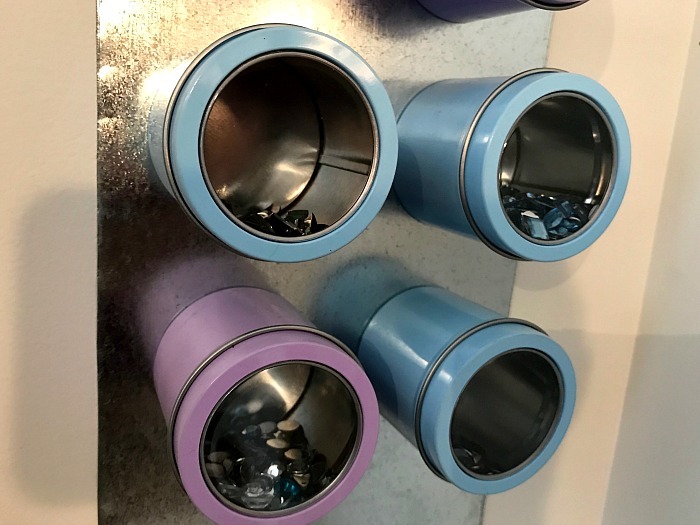 I stumbled across these magnetic containers at the Christmas tree shop and they were 3 for a dollar. I asked Hubs for a sheet of metal that I could have and glued that onto the wall. 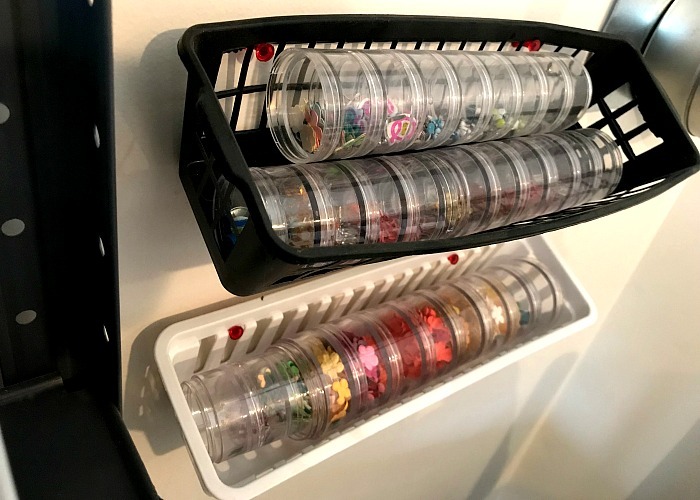 Next, I simply sorted my brads out and filled my containers and done! Super simple, costs less than a few dollars and easy to use. Another of my favorites things to make are Christmas ornaments. Twine is used with most of my ornaments and there is nothing worse than tangled twine. 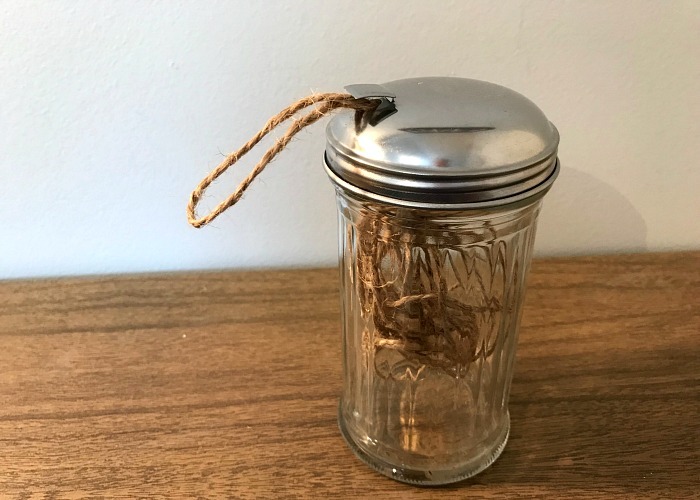 I had this sugar container in my kitchen that I was going to purge and thought that might work perfectly for my twine. Now my twine is kept on a shelf, is easy to find and even easier to use. Not only do I like to make greeting cards but I also love to make gift tags. The problem is I would just toss those tags into a basket and later would spend so much time looking for the perfect tag for my wrapped gifts. I stumbled on this idea online and have been using it ever since. A hanging jewelry organizer will hold all sizes of gift tags so I can see them all clearly and quickly. 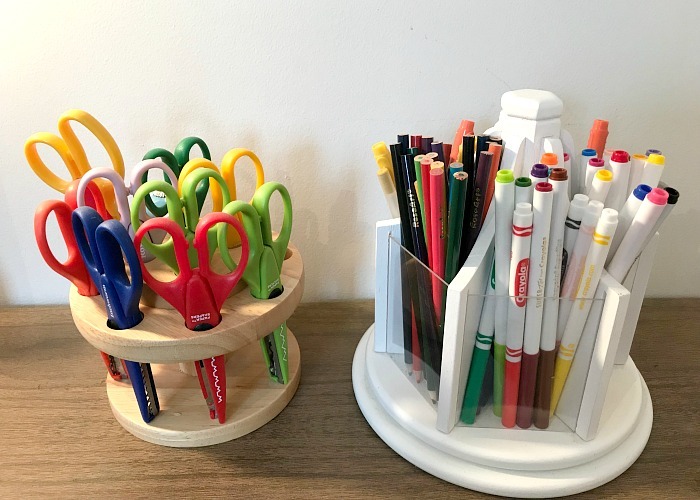 The best part is there are two sides to this organizer so it holds twice as much. 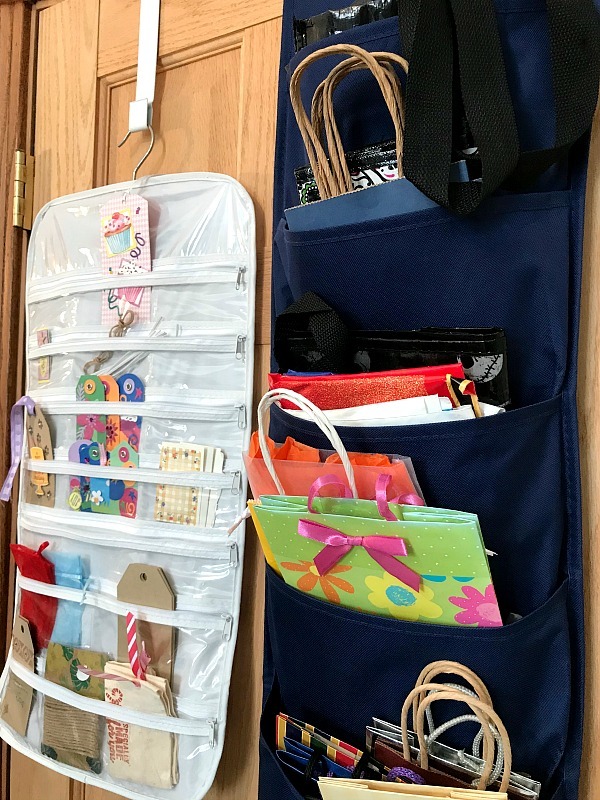 Along the same lines, I found a larger organizer that holds my gift bags. And finally, a third style to hold tissue paper and a few canvas type bags as well. I keep my wrapping paper in an old trash can close by. Now I have a gift wrapping station all set up and easy to use. 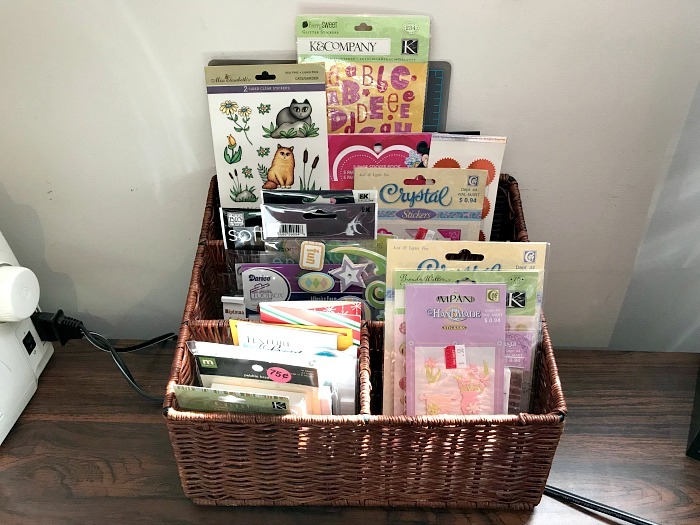 Luckily my craft room also has a closet that is perfect for keeping gifts I find throughout the year. Read: The Gift Closet. My Favorite Frugal Tip. 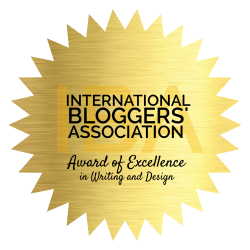 Next, we have ribbons. If you are like me then ribbons are another weakness of yours. I love them for my cards, tags, even gift toppers. 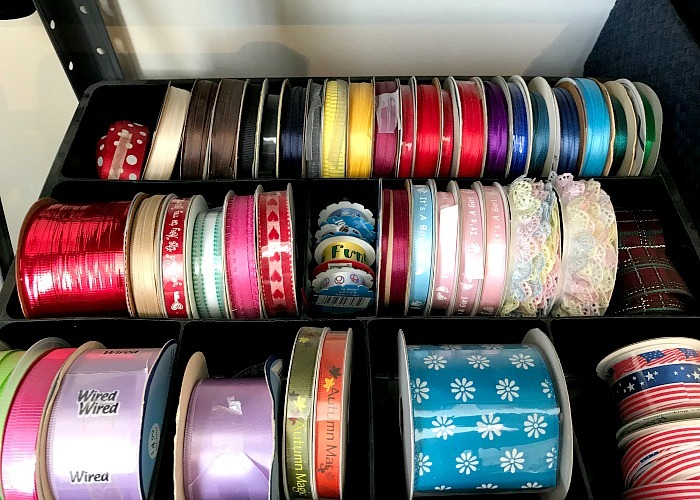 I tried many different ways to organize my ribbons but these few works the best for me. I grabbed this kitchen wooden tray at a yard sale and purchased (eeek!) 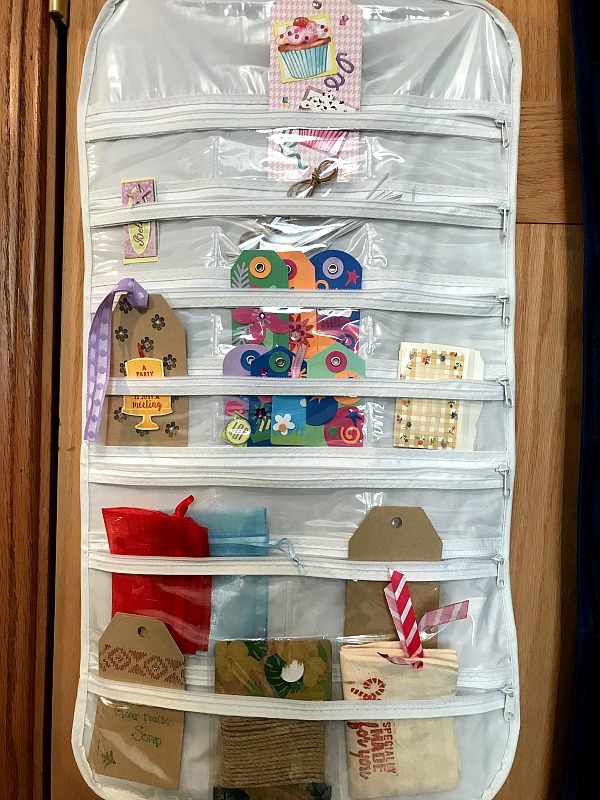 this ribbon organizer from the Container Store. Both work just as well but one cost $19.99 and the other was just 50 cents. This just goes to show you that you do not need to spend a ton of money to organize your things. 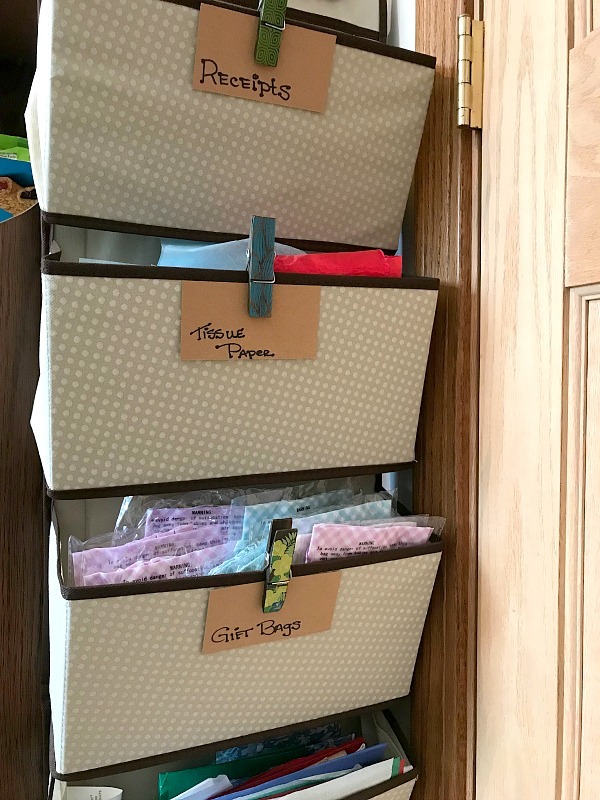 For my odd sized ribbons, I use a desk organizer that was $4 at Walmart. 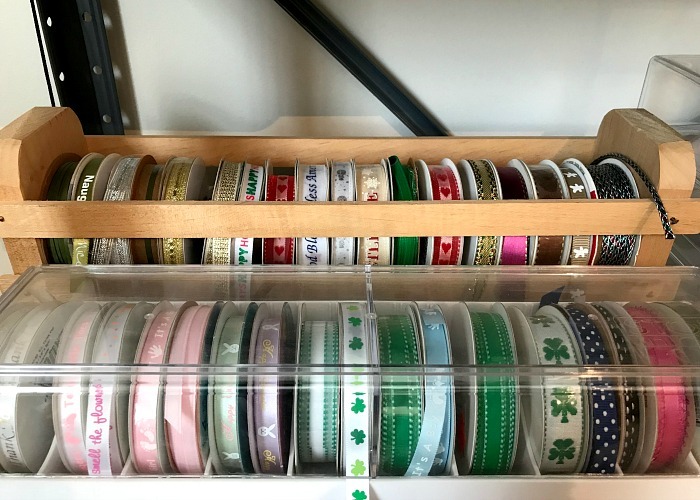 The dividers are perfect for different sized ribbons and it fits on my shelf so all my ribbons are easy to see. Another love of mine are punches. This was an expensive purchase but I did not buy it for my craft room. I instead bought it for my kitchen but ended up not liking it at all. I tossed it into my attic frustrated that I wasted so much money. A year later when I was in my attic I stumbled across that tray again and thought it might just work for my paper punches. It is very durable which is good because punches are heavy. I can pull the entire tray out when I am working and see all the punches at a glance. Stickers are another thing I love and this divider is perfect for my frequently used stickers. It keeps them out where I can see them easily and it’s easy to move when I am working. Cost? 25 cents from a yard sale. BOOM! This is the same organizer I used here but a bit more than my 25 cent price tag I’m afraid. Another yard sale score were these clear envelopes. I love these things and I find that they are definitely worth the cost. 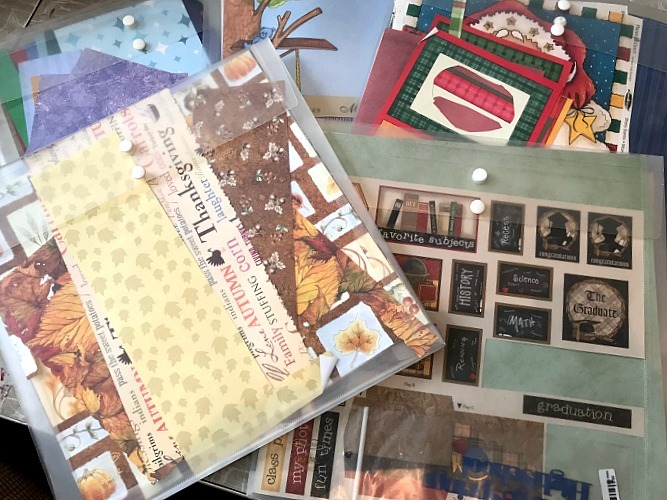 I keep my craft paper organized by theme this way and it makes things super quick when working on a project. There is nothing better than finding a yard sale of a crafter that is cleaning out their craft room! I got these brand new clear envelopes at 10 cents a piece! Ninja tip: If you are a starter of projects yet a finisher of few this tip is for you! Clear plastic totes like these are great for holding a project in progress. Label the outside with what the project is, who it is for and the due date. Place that due date on your calendar so you force yourself to stay on track. 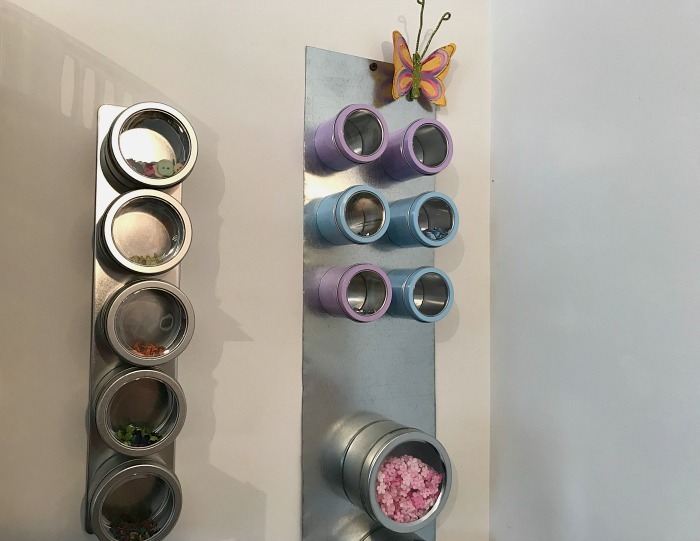 A few more organizing ideas for you to consider. 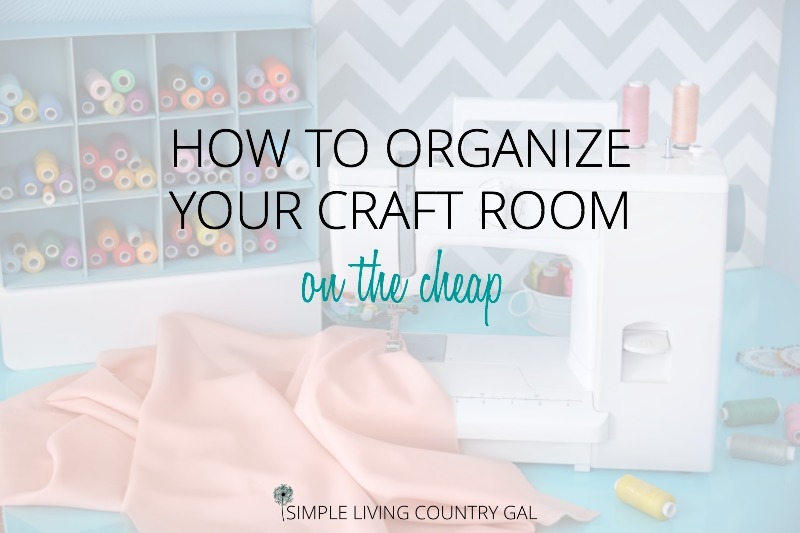 Remember when organizing you don’t have to spend a fortune. Look at what you want to organize then take a walk around your home searching for a solution. Sometimes what you need is right under your nose. Think outside of the box and find unique ways to sort and organize what you have in a way that makes sense and works specifically for you. There are no rules in organizing! As long as you use it, then you have succeeded! !